Working from home is probably one of the best parts of my job. I love that I can work in my sweats, work a schedule that accommodates my family, and my commute is just down the staircase to our basement. Sometimes though, motivating myself to work is tough. I decided that as better motivation I needed an inspirational space to work in. In order to flow with the rest of the house, I of course went with a vintage modern office. 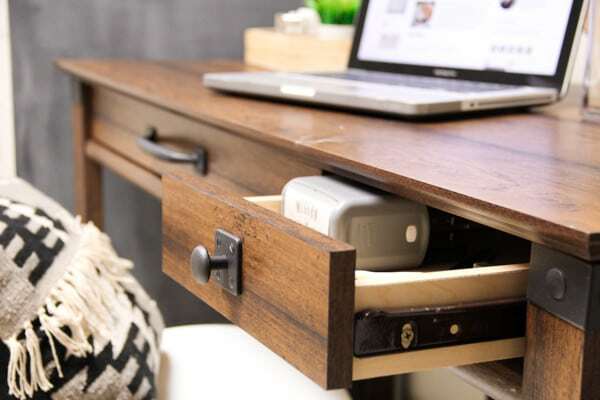 The two simple drawers on this desk were just enough space for the essentials, without leaving space to be a dumping ground for office supplies. Because my real job (admin for a transport company), involves TONS of paperwork, the two large ugly file cabinets are a necessity. In order to try and like them a bit more, I painted the side with chalkboard paint, and added a stained wood top to them. Not only do I spend a lot of time working down here, I often blog here too. When I blog I am often inspired by pictures and magazine pages that I have torn out. 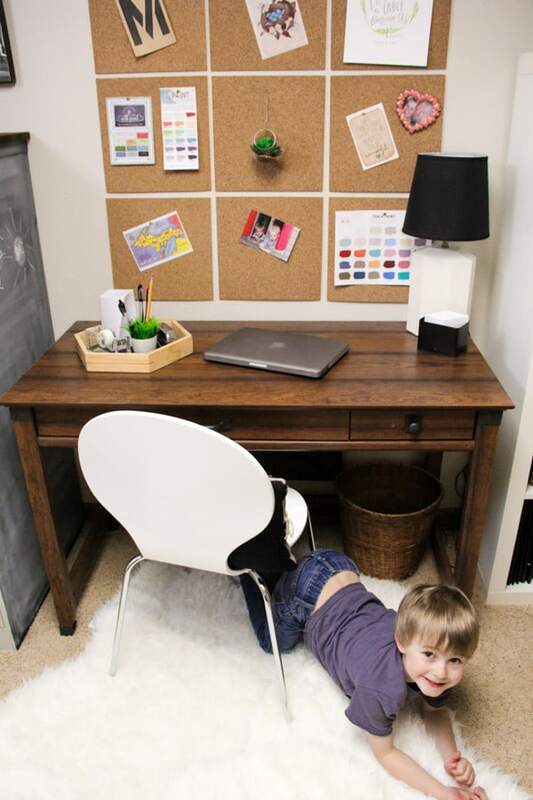 I created a space to display that inspiration by attaching these cork squares to the wall. Now that I’ve got the perfect desk, I’ve got functional shelving next to it, to hold my printer, paper, and other supplies. On my desk I also added this little octagon tray for the supplies I use the most. Isn’t the little faux plant pen holder adorable? Now that I’ve got an office space that is inspiring, I enjoy coming down here to work a lot more, it still doesn’t mean it’s all work all the time, with this little guy vying for my attention! He’s decided the sheep rugs under my feet make the perfect place to play while I work! 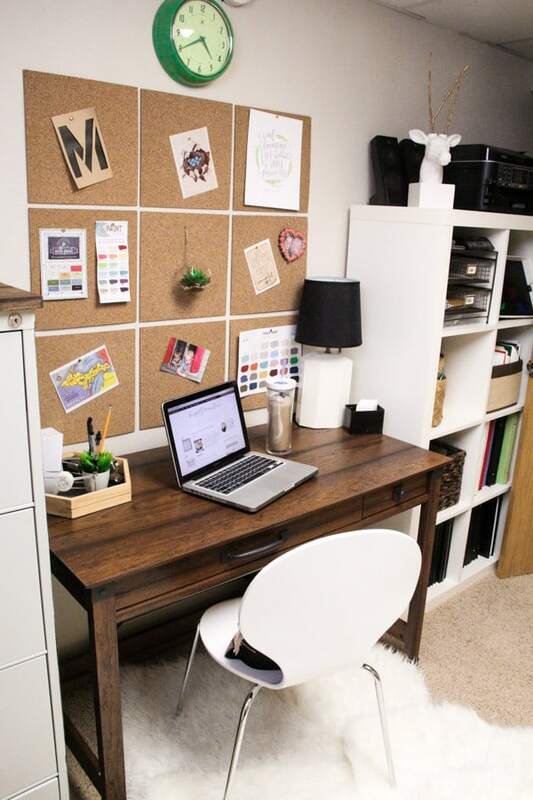 So do you have an inspirational space to work in? How do you motivate yourself to get work done? I hope this post gave you a few ideas! 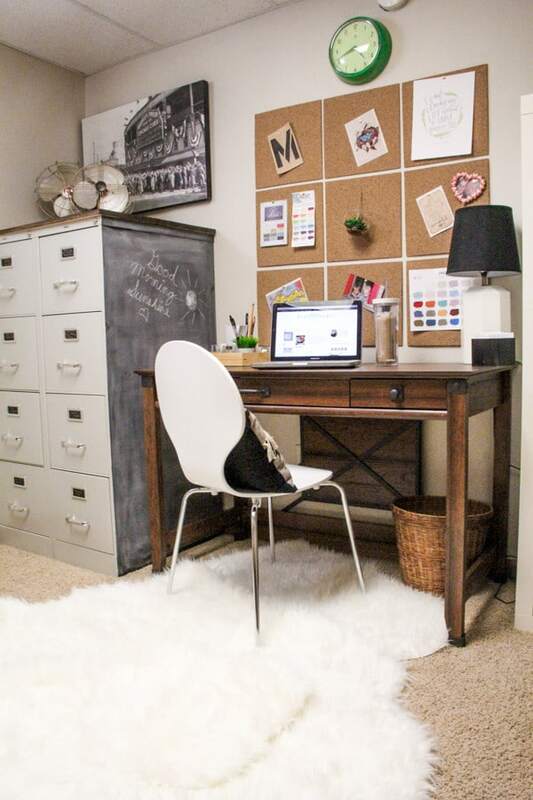 Gah I love seeing inspiring offices like yours. Mine is completely blah and I really NEED to kick that makeover into high gear. 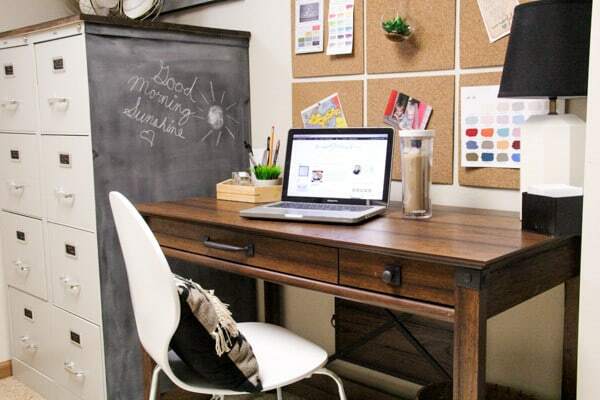 You’re so right on downsizing desks. I’m working in a recent thrift score into my new design. 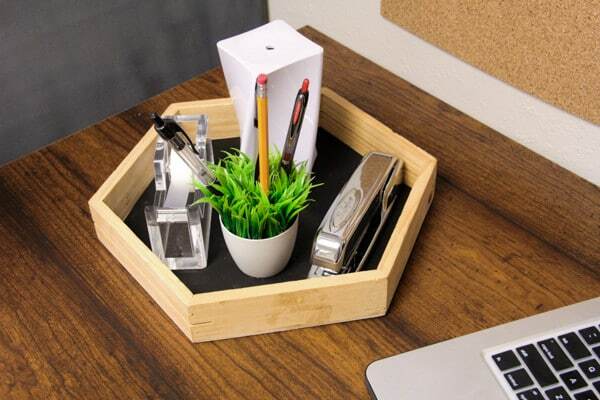 Love the octagon tray to corral all those office supplies. 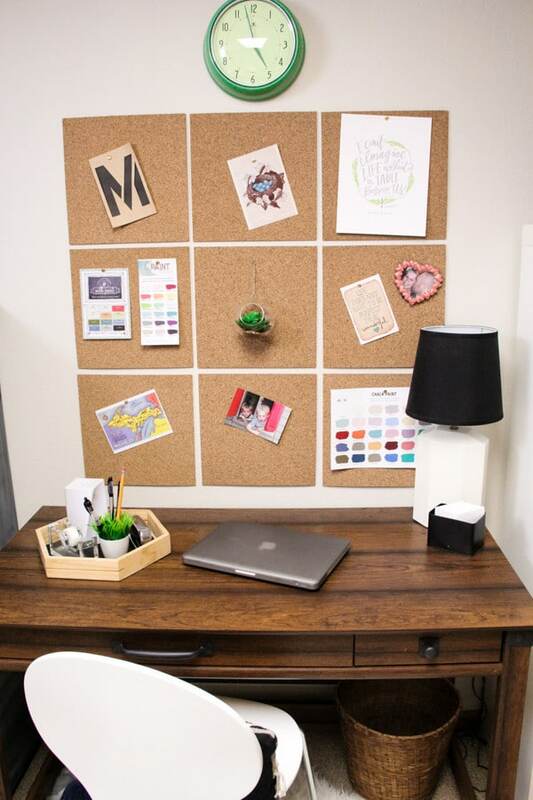 So glad you have a space that inspires you to work! Thank you so much! 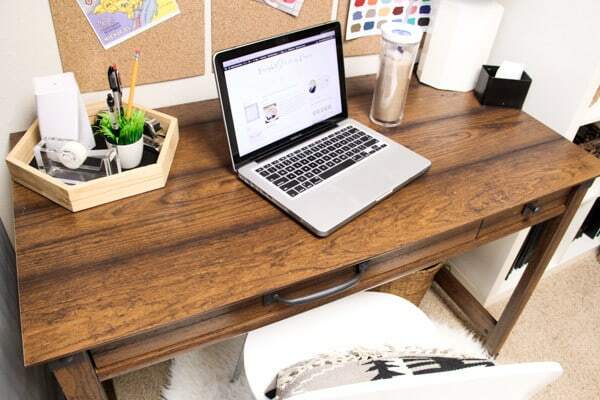 I’m excited to see your thrifted desk in your design! Isn’t the octagon great? Makes dusting way easier too!